The soprano Daniela Dessì died suddenly on 20th August 2016, aged 59. She was hailed by critics and colleagues as one of the finest voices the world of opera has ever known. Dynamic pays tribute to the great soprano with this recording, filmed just one year before her untimely death. Her performance of Giordanos Fedora was one of the pinnacles of her stunning artistic career. In the famous aria O grandi occhi lucenti from Act One, she delivers a technically perfect and emotionally passionate performance worthy of a great star. The story takes place at the end of the 19th century, in St. Petersburg (Act One), Paris (Act Two) and Switzerland (Act Three). It's an operatic crime story, a drama of passion, revenge and guilt that unravels against a historical backdrop of Czarist Russia's political and ideological conflicts in the late 19th century. 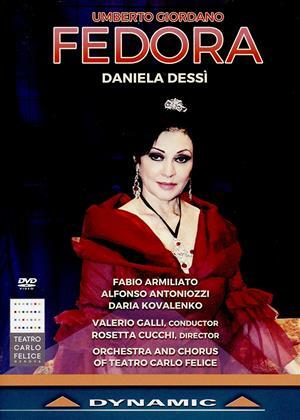 Daniela Dessì is a complete prima donna of outstanding finesse, her rich voice both powerfully intense and deeply expressive. Tenor Fabio Armiliato shines particularly in the famous aria Amor ti vieta from Act Two, with a commanding and highly expressive stage presence in support of a powerful and wonderfully nuanced voice. The finale of the opera is reserved for the two protagonists, companions both on stage and in life. The singers surpass themselves, and it is impossible not to be moved when Fedora dies, believing that fate would shortly turn theatrical makebelieve into reality.